Who can be a PI? What must be reviewed by the IRB? Who is a Human Subject? Due to the implementation of the revised research regulations, the IRB's turn-around times for reviews are currently unfortunately a little longer than we’d like them to be. We expect the delays to be temporary and will update this page once this is resolved. The current IRB timelines are posted below as a general guide only. Submissions that are incomplete or do not adhere to IRB submission guidelines may require additional time. Please submit early whenever practicable. Please note that the time to when the IRB review is complete is not the same as time to approve. Approval is dependent on meeting the regulatory criteria and the cooperation of the investigator(s) to respond to the IRB's requests for modifications in a timely manner. It may also be affected by outside factors such as the Conflict of Interest Committee, other Ancillary Committees, or the FDA. Investigators frequently request that the IRB expedite a review. However, in general, studies are reviewed in the order in which they are received. The current volume of submissions precludes pulling items out of the queue unless it is a true emergency that will adversely affect study subjects. Reviewing studies out of order means that other investigators' submissions will receive timely review. Investigators who believe that their submission requires immediate processing, should contact the IRB Office or the IRB Chair and provide justification and a description of the specific circumstances. Generally, studies are reviewed within 3-5 weeks of submission. Studies that require full board review and approval are placed on the next available agenda. 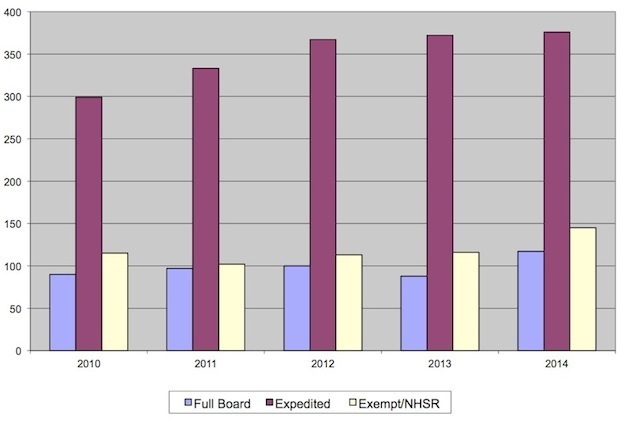 The IRB receives approximately 10 new studies each month that require full board review. The full board meets twice a month; the interval between submission and review depends on the timing of the submission relative to the next scheduled meeting. Letters are sent to the PI within one week of the IRB meeting. Studies eligible for expedited review make up approximately 75% of the IRB's new volume (excluding exempt determinations). The expedited studies are reviewed by the chair, one of the vice-chairs or (less frequently) by another designated member. The IRB's target is to review and send letters to investigators within 3 weeks of submission. The exact timing depends on whether or not there are conflicting demands and the volume of submissions. To ensure that the NIH's timelines are met, the IRB Office encourages investigators to start working on the study submission in eIRB as soon as a fundable score is received. Investigators should alert the IRB as soon as possible when a just-in-time review will be needed. 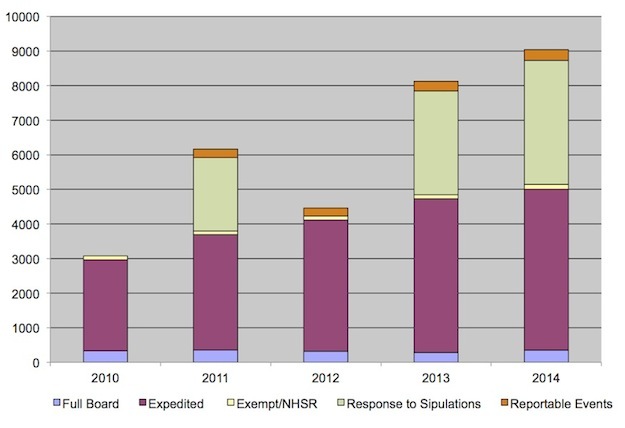 Amendments make up the largest proportion of all submissions received by the IRB Office. The large number is due to studies that are amended multiple times in a single year. Full amendments are given a lower priority within the IRB Office than new submissions and responses to stipulations. They are generally reviewed within 3-5 weeks of submission. All amendments should be accompanied by a cover letter that outlines the justification(s) for each requested change. Failure to plan ahead can result in investigators submitting multiple amendments in rapid succession; these submissions receive the lowest priority for review. Amendment that are limited to additions and/or removals of study team members (not the Principal Investigator) are typically reviewed within 2 business days. To facilitate processing, all study team members must be current on their required CITI training. For more information, see the CHOP intranet page on Human Subject Protections Training. To prevent a delay in the review of an amendment, ensure the study application is updated to correspond to any changes being made. Upload revised documents into the main study SmartForm using the Edit button. Guidance for Updating Documents in eIRB. Generally, submissions for continuing approval are reviewed within 4-6 weeks of submission. The IRB instructs researchers to submit the information required for continuing review at least 45 days prior to expiration. With the current submission volume experienced by the IRB office, this generally allows for sufficient time for IRB review and correspondence with the research team. The CHOP IRB's goal is to process each submission in a fair and efficient manner. The current volume of submissions precludes us from pulling items out of the queue unless it is a true emergency that will adversely affect study subjects. To do so would delay the processing of submissions from other investigators. the total volume of IRB submissions at the time of the submission.